It has been shown that peptides corresponding to the NF-κB essential modifier-binding domain (NBD) of IκB kinase α or IκB kinase β specifically inhibit the induction of NF-κB activation without inhibiting the basal NF-κB activity. The present study demonstrates the effectiveness of NBD peptides in inhibiting the disease process in adoptively transferred experimental allergic encephalomyelitis (EAE), an animal model of multiple sclerosis. Clinical symptoms of EAE were much lower in mice receiving wild-type (wt)NBD peptides compared with those receiving mutated (m)NBD peptides. Histological and immunocytochemical analysis showed that wtNBD peptides inhibited EAE-induced spinal cord mononuclear cell invasion and normalized p65 (the RelA subunit of NF-κB) expression within the spinal cord. Analysis of lymph node cells isolated from donor and recipient mice showed that wtNBD peptides but not mNBD peptides were able to shift the immune response from a Th1 to a Th2 profile. Consistently, wtNBD peptides but not mNBD peptides inhibited the encephalitogenicity of myelin basic protein-specific T cells. Furthermore, i.p. injection of wtNBD peptides but not mNBD peptides was also able to reduce LPS- and IFN-γ-induced expression of inducible NO synthase, IL-1β, and TNF-α in vivo in the cerebellum. Taken together, our results support the conclusion that NBD peptides are antineuroinflammatory, and that NBD peptides may have therapeutic effect in neuroinflammatory disorders such as multiple sclerosis. Multiple sclerosis (MS)3 is the most common human demyelinating disease of the CNS. Although the etiology of MS is not completely understood, studies of MS patients suggest that the observed demyelination in the CNS is a result of a T cell-mediated autoimmune response (1). Experimental allergic encephalomyelitis (EAE) serves as an animal model for MS (2, 3, 4). Studies using the adoptively transferred EAE model strongly support the view that activated neuroantigen-specific T cells cross the blood-brain barrier (BBB), infiltrate the CNS parenchyma, and initiate an inflammatory response (1, 2, 3, 4). The identification of a wide range of proinflammatory cytokines, cell adhesion molecules, chemokines, proinflammatory enzymes like inducible NO synthase (iNOS), and cyclooxygenase in CNS lesions of MS patients and EAE animals (1, 2, 3, 4, 5), suggests that a broad-spectrum inflammatory process in the CNS plays an important role in the pathogenesis of these diseases. Analysis of molecular mechanisms for the regulation of these inflammatory molecules in activated glial cells and in neural tissues of EAE should help decipher the mechanisms of the disease process in MS/EAE and further the possibility of development of effective therapies for MS patients with drugs that block the activation of inflammatory signaling pathways. Presence of the consensus DNA binding site for NF-κB in promoter regions of most proinflammatory molecules, and inhibition of induction of their expression upon inhibition of NF-κB activation, suggest that activation of NF-κB is important for the induction of proinflammatory molecules (6). Consistently, Hilliard et al. (7) have found that NF-κB1 (p50/p105)-deficient B6.129 mice were significantly resistant to EAE. We have also found that NF-κB is activated in vivo in spinal cords of Lewis rats with EAE, and that inhibition of in vivo activation of NF-κB by pyrrolidine dithiocarbamate attenuates clinical symptoms of EAE (8), suggesting that activation of NF-κB contributes to the disease process of EAE. However, mounting evidence also suggests that activation of NF-κB is involved in normal cell physiology and viability (9, 10), raising the possibility that activation of NF-κB in neural tissues of EAE animals may be a protective response against the disease. Considering the fact that the studies by Hilliard et al. (7) in B6.129 mice do not exclude strain artifacts caused by cosegregation of the p50 knockout locus with EAE-relevant locus, and that pyrrolidine dithiocarbamate (8) is not a specific inhibitor of NF-κB activation, it is important to determine the specific role of induced activation of NF-κB in the disease process of EAE. Activation of NF-κB requires the activity of IκB kinase (IKK) complex containing (IKKα and IKKβ) and the regulatory protein NF-κB essential modifier (NEMO). Recently, it has been shown that peptides corresponding to the NEMO-binding domain (NBD) of IKKα or IKKβ specifically inhibit the induction of NF-κBactivation without inhibiting the basal NF-κB activity (11). Therefore, to understand the specific role of induced activation of NF-κB in the disease process of EAE, we have examined the effect of NBD peptides on the disease process of EAE. In this study, we show that NBD peptides block the activation of neuroantigen-primed T cells, exert anti-inflammatory effect in vivo in the CNS, and inhibit the adoptive transfer of EAE in female SJL/J mice. Wild-type (wt) and mutated (m) NBD peptides were synthesized from the Peptide Synthesis Facility of the University of Nebraska at Lincoln. Rabbit anti-nitrotyrosine, rabbit anti-NF-κB p65, and goat anti-glial fibrillary acidic protein (GFAP) were purchased from Santa Cruz Biotechnology (Santa Cruz, CA). Rat anti-mouse pan macrophage marker (moma-2) and rat anti-mouse CD11b were purchased from BioSource International (Camarillo, CA). Specific pathogen-free female SJL/J mice (4–6 wk old) were purchased from Harlan Sprague Dawley (Indianapolis, IN). By adoptive transfer of MBP-reactive T cells. It was performed as described earlier (12). Briefly, donor mice were immunized s.c. with 400 μg of bovine myelin basic protein (MBP; Invitrogen Life Technologies, Carlsbad, CA) and 60 μg of Mycobacterium tuberculosis (H37RA; Difco Labs, Detroit, MI) in IFA (Calbiochem, San Diego, CA). Animals were killed 10–12 days postimmunization, and the draining lymph nodes were harvested. Single-cell suspensions were cultured at a concentration of 4–5 × 106 cells/ml in six-well plates in RPMI 1640 supplemented with 10% FBS, 50 μg/ml MBP, 50 μM 2-ME, 2 mM l-glutamine, 100 U/ml penicillin, and 100 μg/ml streptomycin. On day 4, cells were harvested and resuspended in HBSS. A total of 2 × 107 viable cells in a volume of 200 μl was injected into the tail vein of naive mice. Pertussis toxin (150 ng/mouse; Sigma-Aldrich, St. Louis, MO) was injected once via i.p. route on 0 day posttransfer (dpt) of cells. Cells isolated from donor mice immunized with CFA or IFA alone were not viable after 4 days in culture with 50 μg/ml bovine MBP and therefore were not transferred. MBP reactivity of lymph node cells (LNC) was measured by [3H]thymidine (NEN, Boston, MA) incorporation assay of parallel microplate cultures (12, 13). By active immunization of MBP. It was performed as described earlier (8) with some modifications. Briefly, female SJL/J mice were immunized s.c. on both sides of the flanks with 500 μg of guinea pig MBP and 60 μg of M. tuberculosis in IFA. Mice also received pertussis toxin (400 ng/mouse) via i.p. route on 0 and 2 days of immunization. Control mice received PBS (vehicle), M. tuberculosis, IFA, and pertussis toxin. Animals were observed daily for clinical symptoms. Experimental animals were scored by an masked investigator as follows: 0, no clinical disease; 0.5, piloerection; 1, tail weakness; 1.5, tail paralysis; 2, hindlimb weakness; 3, hindlimb paralysis; 3.5, forelimb weakness; 4, forelimb paralysis; and 5, moribund or death. wtNBD and mNBD peptides contain the Antennapedia homeodomain (in lowercase) and IKKβ (in uppercase) segments (11), and positions of W→A mutations are underlined (11): wtNBD, drqikiwfqnrrmkwkkTALDWSWLQTE; mNBD, drqikiwfqnrrmkwkkTALDASALQTE. These peptides were solubilized in saline. Groups of mice were treated with wtNBD and mNBD peptides separately through i.p. injection in a blinded fashion at dosages ranging from 0.75 to 1.25 mg/kg of body weight/alternate day from 0 dpt. Mice were also treated with 1 mg of peptides/kg of body weight/alternate day at various time points of the disease process (acute onset and relapse onset). Control mice received the injections of saline as the vehicle. Statistical analyses were determined by the RS/1 multicomparison procedure using a one-way ANOVA and Dunnett’s test for multiple comparisons with a common control group. Differences between means were considered significant when p values were <0.05. Nuclear extracts from spleen of control and NBD peptide-treated donor mice were prepared as described earlier (8) with slight modifications. Briefly, spleens were homogenized in buffer A (10 mM HEPES (pH 7.5), 10 mM KCl, 0.1 mM EGTA, 1.0 mM DTT, 1 mM PMSF, and 10 μg/ml each of leupeptin, antipain, aprotinin, and pepstatin A), incubated on ice for 15 min, and treated with 1.0% Nonidet P-40. The extract was then vortexed for 15 s and centrifuged at 14,000 × g for 30 s. The pelleted nuclei were resuspended in buffer B (25% glycerol, 0.4 M NaCl, 20 mM HEPES (pH 7.5), 1 mM EGTA, 1.0 mM EDTA, 1.0 mM DTT, 1 mM PMSF, and protease inhibitors), vortexed, sonicated briefly, and incubated on ice for 30 min. The lysates were then centrifuged at 14,000 × g for 10 min. Supernatants containing the nuclear extract were collected and used for EMSA using 32P-end-labeled, double-stranded (NF-κB, 5′-AGTTGAGGGGACTTTCCCAGGC-3′ (Promega, Madison, WI)) oligonucleotides as described earlier (14, 15). Double-stranded mutated (NF-κB, 5′-AGTTGAGGCGACTTTCCCAGGC-3′ (Santa Cruz Biotechnology)) oligonucleotides were used to verify the specificity of NF-κB binding to DNA. On 17 dpt (acute phase), six mice from each of the following groups (control, vehicle-treated EAE, and EAE mice receiving either wtNBD or mNBD peptides from 8 dpt) were anesthetized. After perfusion with PBS (pH 7.4) and then with 4% (w/v) paraformaldehyde solution in PBS, whole spinal cord was dissected out from each mouse. The tissues were further fixed and then divided into two longitudinal halves: one-half of the spinal cord was processed for immunofluorescence microscopy, whereas the other half was used for histological staining as described (12). Briefly, for immunofluorescence microscopy, samples were incubated in PBS containing 0.05% Tween 20 (PBST), 10% sucrose for 3 h, and then 30% sucrose overnight at 4°C. The spinal cord tissues were then embedded in OCT (Tissue-Tek, Elkhart, IN) at −80°C, and processed for conventional cryosectioning. Frozen sections (8 μm) were treated with cold ethanol (−20°C) followed by two rinses in PBS. Samples were blocked with 3% BSA in PBST and incubated in PBST-BSA and rabbit anti-NF-κB p65 (1:50). For double-labeling, tissue sections were incubated with rabbit anti-NF-κB p65 (1:50) along with one of the following Abs: rat anti-mouse panmacrophage marker moma-2 (1:25), rat anti-mouse CD11b (1:30), goat anti-GFAP (1:100), and goat anti-CD3 (1:50). After three washes in PBST, sections were further incubated with Cy2 and Cy5 (Jackson ImmunoResearch Laboratories, West Grove, PA). For negative controls, a set of sections was incubated under similar conditions without the primary Abs. The samples were mounted and observed under a Bio-Rad (Hercules, CA) MRC1024ES confocal laser-scanning microscope. For histological analysis, routine histology was performed to obtain perivascular cuffing and morphological details of spinal cord tissues of EAE mice. Paraformaldehyde-fixed tissues were embedded in paraffin, and serial sections (4 μm) were cut. Sections were stained with conventional H&E staining method. Digital images were collected under bright-field setting using a ×40 objective. Female SJL/J mice were immunized s.c. with 400 μg of bovine MBP and 60 μg of M. tuberculosis in IFA. From day 0 of immunization, mice were treated (i.p.) with wtNBD and mNBD peptides (1 mg/kg of body weight/alternate day). Lymph nodes were collected from these mice on days 10–12 postimmunization, and LNC were tested for proliferation and induction of Th1 (IFN-γ) and Th2 (IL-4 and IL-10) cytokines in response to MBP. EAE was induced in female SJL/J mice by adoptive transfer of MBP-primed T cells as described above. From the onset of acute phase (8 dpt), mice were treated (i.p.) with wtNBD and mNBD peptides (1 mg/kg of body weight/alternate day). On 18 dpt, lymph nodes were collected, and LNC were tested for proliferation and induction of Th1 (IFN-γ) and Th2 (IL-4 and IL-10) cytokines in response to MBP. Concentrations of IFN-γ, IL-4, and IL-10 were measured in culture supernatants by high-sensitivity ELISA kits (BD Biosciences, Mountain View, CA). For Th1 conditioning, LNC from MBP-immunized mice were cultured in a 24-well tissue culture plate with various doses of MBP in the presence of 2 ng/ml IL-12 (BD Biosciences) and 100 ng/ml anti-IL-4 (BD Biosciences). However, for Th2 conditioning, cells were incubated with various doses of MBP in the presence of 3 μg/ml anti-IL-12 (R&D Systems, Minneapolis, MN) and 100 ng/ml IL-4 (R&D Systems). Following 4 days of incubation, supernatants were collected to assay IFN-γ and IL-10. Female SJL/J mice (4–6 wk old) were anesthetized by ketamine and xylazine and underwent cerebellar operations in a Kopf small-animal stereotaxic instrument (David Kopf Instruments, Tujunga, CA). Briefly, the animal was mounted in a stereotaxic frame on a heating blanket. Body temperature was maintained at 37 ± 0.5°C during the time of surgery. A midsagittal incision was made to expose the cranium and a hole <0.5 mm in diameter was drilled with a dental drill over the cerebellum according to the following coordinates: anteroposterior, −6.3 mm; lateral, 0 mm; ventral, 2 mm relative to bregma (16) (as shown in Fig. 11⇓⇓A). The combination of LPS (2 μg) and IFN-γ (10 U) in a volume of 2 μl of saline was injected using a 5-μl syringe (Hamilton, Reno, NV) over a period of 2 min, and the needle was held in place for another minute before withdrawing it from the skull to prevent reflux up the needle tract. Similarly control mice received 2 μl of saline. The incision was closed with surgical staples and covered with a mixture of bacitracin and Hurricane (20% benzocaine; Beutlich, Waukegan, IL). Total RNA was isolated from cerebellar regions surrounding the point of injection (2-mm radius) using Ultraspec-II RNA reagent (Biotecx Laboratories, Houston, TX) following manufacturer’s protocol. To remove any contaminating genomic DNA, total RNA was digested with DNase. Semiquantitative RT-PCR was conducted as described earlier (14) using a RT-PCR kit from Clontech Laboratories (Palo Alto, CA). Briefly, 1 μg of total RNA was reverse transcribed using oligo(dT)12–18 as primer and Moloney murine leukemia virus reverse transcriptase (Clontech Laboratories) in a 20-μl reaction mixture. The resulting cDNA was appropriately diluted, and diluted cDNA was amplified using Titanium TaqDNA polymerase (Clontech, Palo Alto, CA) and the following primers: iNOS, sense, 5′-CCCTTCCGAAGTTTCTGGCAGCAGC-3′, and antisense, 5′-GGCTGTCAGAGCCTCGTGGCTTTGG3′; IL-1β, sense, 5′-CTCCATGAGCTTTGTACAAGG-3′, and antisense, 5′-TGCTGATGTACCAGTTGGGG-3′; TNF-α, sense, 5′-TTCTGTCTACTGAACTTCGGGGTGATCGGTCC3′, and antisense, 5′-GTATGAGATAGCAAATCGGCTGACGGTGTGGG-3′; and GAPDH, sense, 5′-GGTGAAGGTCGGTGTGAACG3′, and antisense, 5′-TTGGCTCCACCCTTCAAGTG-3′. Amplified products were electrophoresed on a 1.8% agarose gels and visualized by ethidium bromide staining. The relative expression of cytokines or iNOS (cytokines or iNOS/GAPDH) was measured after scanning the bands with a Fluor Chem 8800 Imaging System (Alpha Innotech, San Leandro, CA). It was performed using the Prism 7700 sequence detection system (Applied Biosystems, Foster City, CA). Briefly, reactions were performed in a 96-well optical reaction plates on cDNA equivalent to 50 ng of DNase-digested RNA in a volume of 25 μl, containing 12.5 μl of TaqMan Universal Master Mix (Applied Biosystems) and optimized concentrations of FAM-labeled probe, and forward and reverse primers following manufacturer’s protocol. All primers and FAM-labeled probes for mouse IL-1β, TNF-α, and GAPDH were obtained from Applied Biosystems. The mRNA expression of IL-1β and TNF-α was normalized to the level of GAPDH mRNA. Data were processed by the Applied Biosystems Sequence Detection System 1.6 software and analyzed by ANOVA. NBD peptides have been shown to inhibit the induction of NF-κB activation without targeting the basal activity of NF-κB (11). However, before using NBD peptides in animal models of EAE, it was important to determine whether these peptides inhibit the induction of NF-κB activation in vivo in these models. In the adoptive transfer model of EAE, encephalitogenic T cells from donor mice are transferred to recipient mice. We investigated whether NBD peptides inhibit the induction of NF-κB activation in vivo in donor mice. Therefore, donor mice were treated with either wtNBD or mNBD peptides (1.0 mg/kg/alternate day) from day 0 of immunization with MBP. On day 12 of immunization, activation of NF-κB was monitored in spleen by EMSA. Marked increase in activation of NF-κB was observed in spleens of MBP-immunized mice (donor) compared with that of mock-injected mice (Fig. 1⇓). However, this enhanced DNA binding was abolished when mutated oligonucleotides were used for DNA binding (Fig. 1⇓, lane 5), suggesting that the observed DNA-binding activity in spleens of donor mice is due to NF-κB. Also, as expected, this DNA-binding activity of NF-κB was inhibited in donor mice treated with wtNBD but not mNBD peptides (Fig. 1⇓). These results suggest that activation of NF-κB is induced in spleen of donor mice, and wtNBD peptides are capable of inhibiting the induction of NF-κB activation in vivo in donor mice. Effect of NBD peptides on the induction of NF-κB activation in vivo in the spleen of donor mice. Donor mice (female SJL/J) were immunized s.c. with 400 μg of bovine MBP and 60 μg of M. tuberculosis in IFA. From day 0 of immunization, mice were treated with either wtNBD or mNBD peptides (1.0 mg/kg of body weight/alternate day). On day 12 of immunization, spleens (mock control (lane 1); donor mice (lane 2); wtNBD-treated donor mice (lane 3); mNBD-treated donor mice (lane 4)) were harvested for the isolation of nuclear extract and EMSA. Lane 5, Binding of spleen nuclear extract from donor mice with mutated NF-κB oligonucleotides. To investigate the role of induced activation of NF-κB in the disease process of relapsing-remitting EAE, we examined the effect of NBD peptides on clinical symptoms and disease severity of adoptively transferred EAE. By adoptive transfer, we have achieved 100% incidence of EAE in female SJL/J mice displaying an acute phase of clinical signs peaking at 17 dpt and, subsequently, a pattern of relapsing-remitting signs in the chronic phase (Table I⇓ and Fig. 2⇓). To determine the appropriate dose of NBD peptides, mice (n = 6 in each group) were treated (i.p.) with different doses of NBD peptides on alternate days from day 0 of transfer of MBP-primed T cells. Clinical symptoms were monitored daily until 32 dpt. We found that wtNBD peptides inhibited the clinical symptoms at a dose of 0.75 mg/kg of body weight, and the maximum inhibition was observed at a dose of 1 or 1.25 mg/kg of body weight (Fig. 2⇓). In contrast, mNBD peptides at a dose of 1 mg/kg of body weight were ineffective in inhibiting the clinical symptoms of EAE (Fig. 2⇓). Therefore, mice were injected with 1 mg/kg of body weight of NBD peptides on alternate days in additional experiments. The results summarized in Table I⇓ demonstrate that wtNBD peptides at the dose of 1 mg/kg of body weight could reduce both the incidence and the clinical signs of EAE in comparison with mice receiving either vehicle or mNBD peptides. Dose-dependent inhibition of adoptive transfer of EAE in SJL/J mice by NBD peptides. EAE was induced in female SJL/J mice by adoptive transfer of MBP-primed T cells. Mice were treated (i.p. injection) with different doses of either wtNBD or mNBD peptides every alternate day from 0 dpt. Six mice were included in each group. Mice were examined for clinical symptoms every day until 32 dpt. Because NBD peptides inhibited clinical symptoms and severity of adoptively transferred EAE, we examined whether these peptides were also able to suppress EAE induced by active immunization. Mice were treated with NBD peptides (1.0 mg/kg of body weight/alternate day) from day 0 of active induction of EAE. The severity of disease symptoms of wtNBD-treated EAE animals were compared with that of vehicle-treated and mNBD-treated EAE animals. Consistent with the inhibition of clinical symptoms in the adoptive transfer model (Fig. 2⇑), wtNBD peptides markedly suppressed clinical symptoms compared with the vehicle-treated group in the actively induced model (Table I⇑). In contrast, mNBD peptides were unable to inhibit the disease process of actively induced EAE (Table I⇑). Next, we investigated whether NBD peptides could be used to prevent the progression of EAE in the adoptively transferred model. To achieve this goal, mice were treated with NBD peptides in two different groups. In the first group, mice were treated with NBD peptides (1 mg/kg of body weight/alternate day) from the onset of acute phase (8 dpt). The results in Fig. 3⇓A clearly show that the inhibitory effect of wtNBD peptides on the clinical symptoms were observed within 4 days of treatment (from 12 dpt). However, there was further marked inhibition on subsequent days of treatment, and this inhibition was maintained throughout the duration of the experiment (Fig. 3⇓A). In contrast, mNBD peptides were ineffective in inhibiting the clinical symptoms of EAE under the same treatment conditions (Fig. 3⇓A). In the second group, NBD peptide treatment began from the onset of relapsing phase (24 dpt) and was continued until 54 dpt. Fig. 3⇓B clearly shows that wtNBD peptides, in this instance, also halted disease progression. However, in contrast to the first instance, the inhibitory effect of wtNBD was manifested only after 8 days of treatment (from 32 dpt). The EAE disease severity was always below or around stage 0.5 from 35 dpt until the end of the study (54 dpt) (Fig. 3⇓B). These results clearly suggest that wtNBD peptides can control the ongoing relapsing-remitting EAE when administered either early (at the onset of acute disease) or late (at the onset of relapsing disease). Treatment of adoptively transferred EAE in SJL/J mice by NBD peptides. EAE was induced in female SJL/J mice by adoptive transfer of MBP-primed T cells. A, One group of EAE mice (n = 6) were treated (i.p. injection) with either wtNBD or mNBD peptides (1.0 mg/kg of body weight/alternate day) from the onset of acute disease (8 dpt). Mice were examined for clinical symptoms every day until 38 dpt. B, The other group of EAE mice (n = 6) were treated (i.p. injection) with wtNBD peptides (1.0 mg/kg of body weight/alternate day) from the onset of relapsing phase (24 dpt). Mice were examined for clinical symptoms every day until 54 dpt. H&E staining of longitudinal sections of spinal cord was conducted to determine whether the diminished clinical disease in wtNBD peptide-treated mice correlated with reduced CNS infiltration of blood mononuclear cells. Blood vessels of the spinal cord of mock control mice were completely devoid of inflammatory infiltrates, whereas substantial perivascular cuffing of mononuclear cells was observed in the spinal cord of EAE mice at the peak (17 dpt) of the acute phase (Fig. 4⇓A). In contrast, very few immune cell infiltrates were found in the spinal cord of mice receiving wtNBD peptides from the onset (8 dpt) of the acute phase (Fig. 4⇓B). However, under the same treatment condition, mNBD peptides were unable to inhibit the infiltration of blood mononuclear cells into the spinal cord of EAE mice (Fig. 4⇓C). Similarly, we also examined infiltration at later time points to assess whether infiltration is reduced or just delayed. Large accumulation of mononuclear cells were observed around blood vessels (Fig. 4⇓D) in spinal cords of EAE mice during the late chronic phase (50 dpt). However, spinal cords of EAE mice receiving wtNBD peptides from the onset of chronic phase (24 dpt) showed very few mononuclear cells during the late chronic phase (50 dpt) (Fig. 4⇓E). These results suggest that NBD peptides may act in part by either preventing activated myelin-specific T cells and/or inflammatory cells from entering into the CNS parenchyma or from being retained in the CNS. NBD peptides inhibit the infiltration of mononuclear cells into spinal cords of adoptively transferred EAE mice. 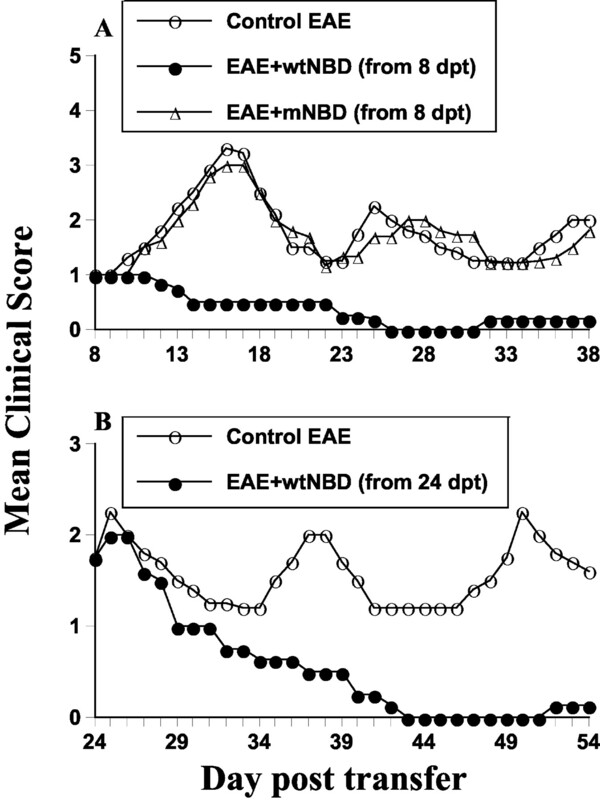 In the first set, EAE animals receiving either wtNBD (B) or mNBD (C) peptides (1.0 mg/kg of body weight/alternate day) from 8 dpt and respective mock-treated EAE mice (control) (A) were sacrificed on 17 dpt. In the second set, EAE animals receiving wtNBD peptides (1.0 mg/kg of body weight/alternate day) from 24 dpt (E) and respective mock-treated EAE mice (control) (D) were sacrificed on 50 dpt. Longitudinal sections of spinal cord isolated from EAE and NBD-treated EAE animals were stained with H&E. Digital images were collected under bright-field setting using a ×40 objective. Consistent with earlier observations by us (8) and others (7) that activation of NF-κB is induced in the CNS of EAE animals, we have observed that the expression of p65 (the RelA subunit of NF-κB) is markedly induced/stimulated in the spinal cord of EAE mice (Fig. 5⇓) compared with that of control mice without EAE (data not shown). This increased level of p65 expression was found in several types of cells, mainly in areas surrounding the infiltration zone, within the spinal cord of EAE mice at the peak (17 dpt) of the disease. Double-labeling analysis of p65 with cell-specific markers showed that induced p65 colocalized with astrocytic GFAP (Fig. 5⇓, A–C), macrophage-monocytic moma-2 (D–F), microglial CD11b (G–I), and T cell marker CD3 (J–L). We then examined the level of p65 in the spinal cord of NBD peptide-treated EAE mice. Mice receiving either wtNBD or mNBD peptides from the onset (8 dpt) of the acute disease were sacrificed on 17 dpt. It is clear from Fig. 6⇓ that, within 9 days of clinical treatment of ongoing EAE, wtNBD but not mNBD peptides were able to inhibit the expression of p65 remarkably in vivo in the spinal cord of EAE mice. Expression of NF-κB p65 in spinal cords of adoptively transferred EAE mice. On 17 dpt, EAE animals were sacrificed, spinal cord sections were double-immunolabeled with p65 and either GFAP (A, GFAP; B, p65; C, both), moma 2 (D, moma 2; E, p65; F, both), CD11b (G, CD11b; H, p65; I, both), or CD3 (J, CD3; K, p65; L, both) and observed under a confocal laser-scanning microscope. NBD peptides inhibit the expression of p65 in spinal cords of adoptively transferred EAE mice. A, EAE animals receiving either wtNBD or mNBD peptides (1.0 mg/kg of body weight/alternate day) from 8 dpt and respective mock-treated EAE mice (control) were sacrificed on 17 dpt. Longitudinal sections of spinal cord isolated from EAE and NBD-treated EAE animals were immunostained with Abs against NF-κB p65 and observed under a confocal laser-scanning microscope. B, p65-positive cells were counted manually by three individuals blinded to the experiment. Values obtained from the control group served as 100%, and data obtained in other groups were calculated as percentage of control accordingly. Results are mean ± SD of six slides (four sections per slide) of each spinal cord isolated from each of three animals. a, p < 0.001 vs EAE. Because MS is a T cell-mediated autoimmune disease that causes widespread inflammation within the CNS, amelioration of the disease process by NBD peptides should be accompanied by inhibition of the activation and differentiation of myelin-specific T cells into effector Th1 cells, and/or attenuation of effector Th1 cell-induced inflammation in the CNS. Therefore, we examined the effect of NBD peptides on proliferation as well as induction of Th1 (IFN-γ) and Th2 (IL-4, IL-10) cytokines by LNC in response to MBP. T cells isolated from lymph nodes of MBP-primed mice proliferated in response to MBP, and the maximum proliferation was observed at 50 or 100 μg/ml MBP (13). Therefore, T cells were stimulated with 50 μg/ml MBP. Fig. 7⇓ shows that treatment of MBP-primed T cells in vitro with wtNBD but not mNBD peptides markedly inhibited the ability of T cells to proliferate (A) as well as to induce IFN-γ (B). 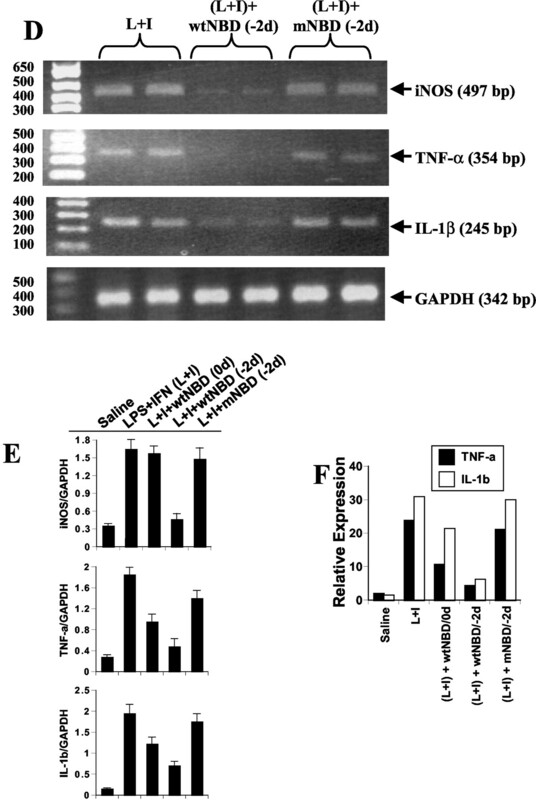 However, in contrast, wtNBD peptides markedly stimulated the induction of IL-4 (Fig. 7⇓C) and IL-10 (D) by MBP-primed T cells. To further confirm this observation, we examined the effect of NBD peptides on the differentiation of MBP-primed T cells into Th1 and Th2 cell types under Th1- or Th2-favoring conditions. MBP-primed T cells produced higher level of IFN-γ under Th1-polarizing condition (Fig. 8⇓A) than nonpolarizing condition (Fig. 7⇓B). However, wtNBD but not mNBD peptides markedly inhibited the ability of MBP-primed T cells to induce the production of IFN-γ under Th1-favoring conditions (Fig. 8⇓A). Similarly, MBP-primed T cells produced higher level of IL-10 under Th2-polarizing conditions (Fig. 8⇓B) compared with nonpolarizing conditions (Fig. 7⇓D). However, in contrast to the inhibitory effect of wtNBD peptides on IFN-γ production, the production of IL-10 under Th2-polarizing condition was further stimulated by wtNBD but not mNBD peptides (Fig. 8⇓B). These results suggest that wtNBD but not mNBD peptides are capable of switching the Th1 response to a Th2 response. Effect of NBD peptides on proliferation and induction of Th1 and Th2 cytokines by MBP-primed T cells. Total LNC from MBP-immunized mice were suspended in RPMI 1640 containing 10% FBS and treated with 50 μg/ml MBP in the presence or absence of different concentrations of wtNBD and mNBD peptides. After 4 days of incubation, proliferation (A) and induction of IFN-γ (B), IL-4 (C), and IL-10 (D) were assayed. All data are mean ± SD of three different experiments. Effect of NBD peptides on the induction of Th1 and Th2 cytokines by MBP-primed T cells under Th1- and Th2-polarizing conditions. 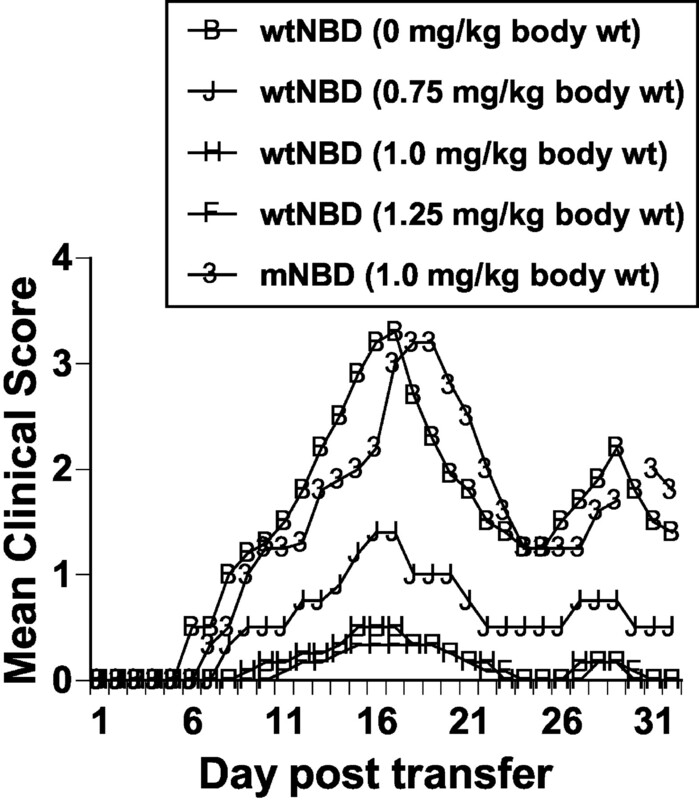 A, For Th1 conditioning, total LNC from MBP-immunized mice cultured with various doses of MBP, 2 ng/ml IL-12 (BD Biosciences), and 100 ng/ml anti-IL-4 (BD Biosciences) in the presence or absence of 30 μg/ml NBD peptides. After 4 days of incubation, induction of Th1 (IFN-γ) cytokine was assayed. B, For Th2 conditioning, total LNC from MBP-immunized mice were cultured with various doses of MBP, 3 μg/ml anti-IL-12 (R&D Systems), and 100 ng/ml IL-4 (R&D Systems) in the presence or absence of 30 μg/ml NBD peptides. After 4 days of incubation, induction of Th2 (IL-10) cytokine was assayed. All data are mean ± SD of three different experiments. Next, we investigated the activation status of MBP-primed T cells isolated from NBD peptide-treated donor mice. T cells isolated from MBP-immunized donor mice proliferated and induced the production of IFN-γ in response to different doses of MBP (Fig. 9⇓, A and B). In contrast, marginal production of IL-4 and IL-10 (Fig. 9⇓, C and D) was observed by T cells in response to different doses of MBP, suggesting that MBP-specific T cells in donor mice are dominated by Th1 cells. However, treatment of donor mice with wtNBD but not mNBD peptides markedly inhibited the ability of T cells to proliferate as well as to induce IFN-γ in response to MBP (Fig. 9⇓, A and B). In contrast, T cells isolated from wtNBD but not mNBD-treated donor mice markedly induced the production of IL-4 and IL-10 (Fig. 9⇓, C and D). Similarly, MBP-primed T cells isolated from control EAE mice (recipient) at the peak of the acute disease (17 dpt) showed increased proliferation and induction of IFN-γ (Fig. 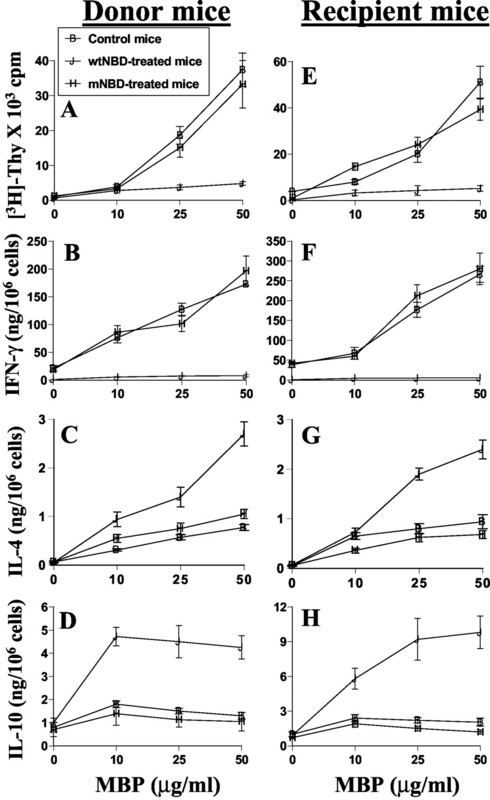 9⇓, E and F) but marginal production of IL-4 and IL-10 (G and H) in response to increasing doses of MBP. Consistent with that observed in donor mice, clinical treatment of recipient mice with wtNBD but not mNBD peptides inhibited the ability of T cells to proliferate and to induce IFN-γ in response to MBP (Fig. 9⇓, E and F). Again, T cells isolated from wtNBD- but not mNBD-treated recipient mice markedly produced IL-4 and IL-10 (Fig. 9⇓, G and H). Taken together, these studies suggest that MBP-primed T cells are enriched in Th1 cells, and that wtNBD peptides are capable of shifting the immune response from a Th1 to a Th2 pattern at various phases of the disease. Treatment of donor and recipient (EAE) mice with NBD peptides modulates proliferation and induction of Th1 and Th2 cytokines by MBP-primed T cells. Donor mice were immunized with MBP, IFA, and M. tuberculosis. From day 0 of immunization, mice were treated (i.p.) with either wtNBD or mNBD peptides (1.0 mg/kg of body weight/alternate day). 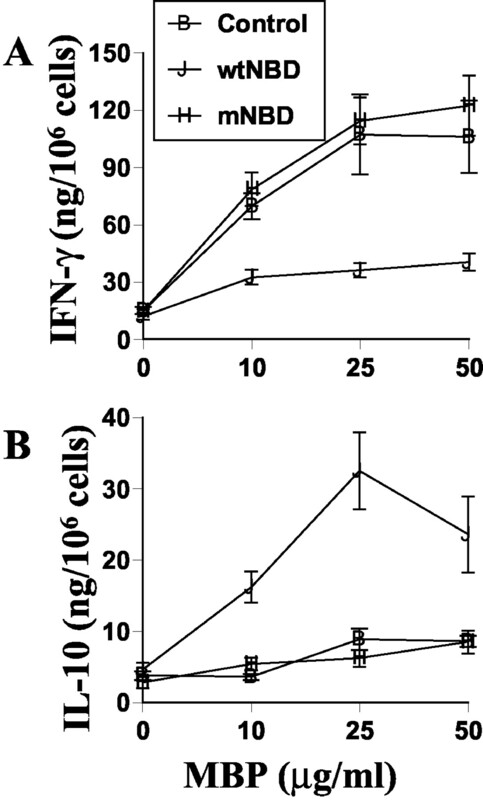 On day 12 of immunization, mice were sacrificed, and total LNC were examined for proliferation (A) and induction of IFN-γ (B), IL-4 (C), and IL-10 (D) in response to MBP. In another set, EAE (recipient) animals receiving either wtNBD or mNBD peptides (1.0 mg/kg of body weight/alternate day) from 8 dpt were sacrificed on 17 dpt. Total LNC were examined for proliferation (E) and induction of IFN-γ (F), IL-4 (G), and IL-10 (H) in response to MBP. Six mice were included in each group, and results are expressed as mean ± SD. Because wtNBD peptides directed MBP-primed T cells, enriched in Th1 cells, to shift to a Th2 pattern (Figs. 7–9⇑⇑⇑), we examined whether wtNBD peptide-treated MBP-primed T cells can induce the disease process of EAE. By adoptive transfer, MBP-primed T cells were capable of inducing the clinical symptoms of EAE displaying an acute phase of clinical signs peaking at 17 dpt and, subsequently, a pattern of relapsing-remitting signs in the chronic phase (Figs. 2⇑, 3⇑, and 10⇓A). However, wtNBD peptide-treated MBP-primed T cells were unable to induce the disease (Fig. 10⇓A). Only piloerection was observed as the highest clinical symptom in few of the animals receiving wtNBD peptide-treated MBP-primed T cells in comparison with complete hindlimb paralysis and/or partial front limb paralysis at the acute phase of the disease in most of the mice receiving MBP-primed T cells (Fig. 10⇓A). In contrast, mNBD peptide-treated MBP-primed T cells induced the clinical symptoms of EAE similar to that of untreated MBP-primed T cells (Fig. 10⇓A). Inhibition of encephalitogenicity of MBP-primed T cells by NBD peptides. A, EAE was induced in female SJL/J recipient mice by adoptive transfer of either MBP-primed T cells, wtNBD-treated MBP-primed T cells, or mNBD-treated MBP-primed T cells. B, Donor mice were immunized with MBP, IFA, and M. tuberculosis. From day 0 of immunization, mice were treated (i.p.) with either wtNBD or mNBD peptides (1.0 mg/kg of body weight/alternate day). On day 12 of immunization, mice were sacrificed, and total LNC were further primed with MBP (50 μg/ml) for 4 days. A total of 2 × 107 viable MBP-primed T cells was adoptively transferred to naive mice. Six mice were used in each group. Mice were examined for clinical symptoms every day until 32 dpt. Because treatment of MBP-primed T cells in vitro with wtNBD peptides blocked their ability to induce EAE in female SJL/J mice, we examined whether treatment of donor mice with NBD peptides inhibits the generation of encephalitogenic T cells. SJL/J mice were immunized with MBP/IFA/M. tuberculosis, and from day 0 of immunization, donor mice were treated (i.p.) with either wtNBD or mNBD peptides (1.0 mg/kg of body weight/alternate day). On day 12 of immunization, mice were sacrificed, and total LNC were further primed with MBP (50 μg/ml) for 4 days. A total of 2 × 107 viable cells was adoptively transferred into naive SJL/J recipients and on 0 dpt, 150 ng of pertussis toxin was injected once via i.p. route. 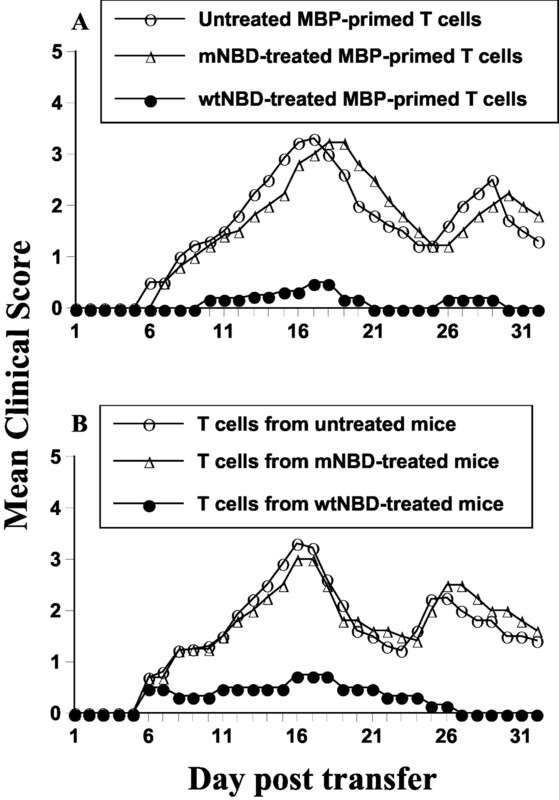 In contrast to MBP-primed T cells isolated from untreated mice or mice receiving mNBD peptides, MBP-primed T cells isolated from mice receiving wtNBD peptides were much less efficient in transferring the disease to recipient mice as judged by a reduction in disease severity (p < 0.001 on 17 dpt) (Fig. 10⇑B). Using various approaches, the studies presented above have shown that wtNBD peptides are capable of inhibiting proliferation, Th1 response, and encephalitogenicity of neuroantigen-primed T cells. However, these studies do not indicate whether wtNBD peptides may have the capacity to inhibit inflammatory reactions in vivo in the CNS induced by encephalitogenic Th1 cells and/or Th1 cell-derived cytokines. In the CNS of MS and EAE, proinflammatory molecules are produced mainly by endogenous glial cells (astrocytes and microglia) and invading cells (macrophages and T cells). We have found that wtNBD but not mNBD peptides are capable of inhibiting the production of proinflammatory molecules (TNF-α and NO) in glial cells (data not shown). We now wanted to determine whether NBD peptides could modulate the expression of inflammatory molecules in a CNS inflammatory model, induced in SJL/J mice by intracerebellar injection of L+I. We examined the expression of three NF-κB-dependent proinflammatory molecules (iNOS, IL-1β, and TNF-α) in the brains of (L+I)-injected mice by semiquantitative RT-PCR and quantitative real-time PCR analysis. The mixture of L+I was microinjected into the cerebellum of female SJL/J mice (Fig. 11⇓⇓A). The treatment schedule with NBD peptides has been shown in Fig. 11⇓⇓B. As expected, microinjection of L+I markedly induced the expression of iNOS, IL-1β, and TNF-α in vivo in the cerebellum, whereas this induction was absent in saline-injected tissues (Fig. 11⇓⇓). In the first group, where the treatment was started from day 0 of microinjection, wtNBD peptides were not very effective in inhibiting the (L+I)-induced expression of iNOS (Fig. 11⇓⇓). However, under the same conditions, wtNBD peptides inhibited the expression of IL-1β and TNF-α by 35–52% in the first group (Fig. 11⇓⇓, C, E, and F). In contrast, remarkable inhibition of (L+I)-induced expression of iNOS, IL-1β, and TNF-α by wtNBD peptides was observed in the second group of animals when the treatment began 2 days before the microinjection (Fig. 11⇓⇓, C, E, and F). In contrast, mNBD peptides were unable to inhibit the (L+I)-induced expression of iNOS, IL-1β, and TNF-α even when the treatment began 2 days before the microinjection (Fig. 11⇓⇓, D–F). NBD peptides reduce (L+I)-induced expression of iNOS, IL-1β, and TNF-α in vivo in cerebellum of female SJL/J mice. A, A mixture of LPS (2 μg) and IFN-γ (10 U/ml) dissolved in 2 μl of saline was stereotactically injected into the cerebellum. The position of injection is shown by an arrow. Control mice received intracerebellar injection of saline (2 μl) only. B, Animals were treated (i.p.) with NBD peptides in two different groups (n = 6). First group of mice received wtNBD peptides (1.0 mg/kg of body weight/day) from 2 days before the microinjection of L+I, and the second group received the same dose of wtNBD peptides from day 0 of microinjection. Treatment was continued, and animals were sacrificed after 2 days of microinjection. C, Cerebellar regions surrounding the point of injection (2-mm radius) were analyzed for iNOS, IL-1β, TNF-α, and GAPDH mRNAs by semiquantitative RT-PCR. D, Groups of mice received either wtNBD or mNBD peptides from 2 days before the microinjection. Treatment was continued, and animals were sacrificed 2 days after the microinjection. Cerebellar regions surrounding the point of injection (2-mm radius) were analyzed for iNOS, IL-1β, TNF-α, and GAPDHmRNAs by semiquantitative RT-PCR. E, The relative expression of cytokines or iNOS (cytokines or iNOS/GAPDH) was measured after scanning the bands with a Fluor Chem 8800 Imaging System (Alpha Innotech). F, DNase-digested RNA samples were analyzed for IL-1β and TNF-α mRNAs by quantitative real-time PCR. Data are expressed as the mean ± SD of six different mice. EAE has long been investigated as a model for MS. However, in contrast to MS, which is a remitting-relapsing disease of chronic nature, the clinical course of some types of mouse and most rat EAE is acute and monophasic. 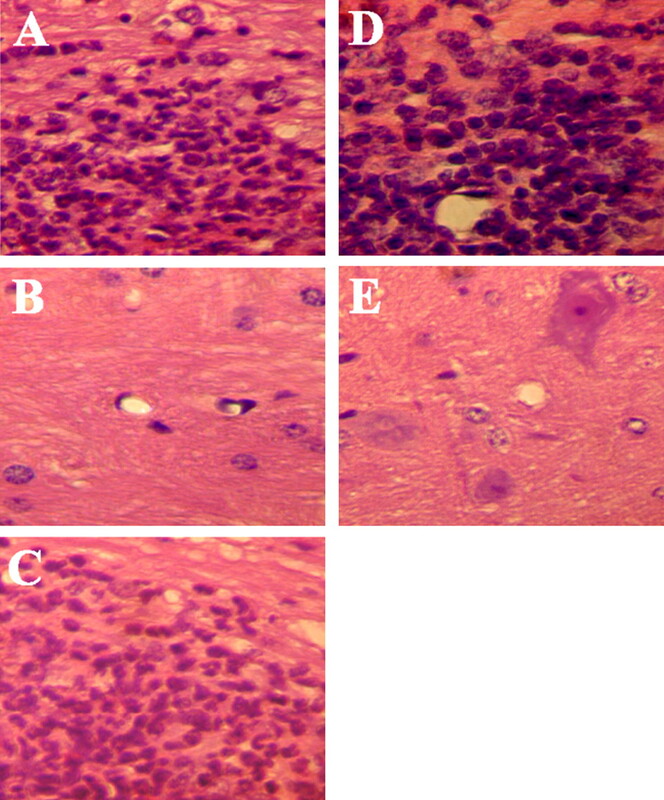 Activation of NF-κB is markedly induced in CNS tissues of EAE animals (7, 8). To understand the role of induced activation of NF-κB in the disease process of EAE, we have used the relapsing-remitting model of EAE, the model that is particularly useful in testing new therapeutic intervention in MS. It has been shown that cell-permeable NBD peptides capable of blocking NEMO/IKK interactions inhibit the induction of NF-κB activation without altering the basal activity of NF-κB (11). Several lines of evidence presented in this paper clearly establish that cell-permeable NBD peptides inhibit the disease process of EAE at multiple steps in an adoptively transferred model in SJL/J mice. Our conclusion is based on the following. First, adoptively transferred MBP-primed T cells were unable to induce the clinical symptoms of EAE in mice having wtNBD but not mNBD peptides. wtNBD peptides were also able to inhibit the progression of EAE when administered either early or late. 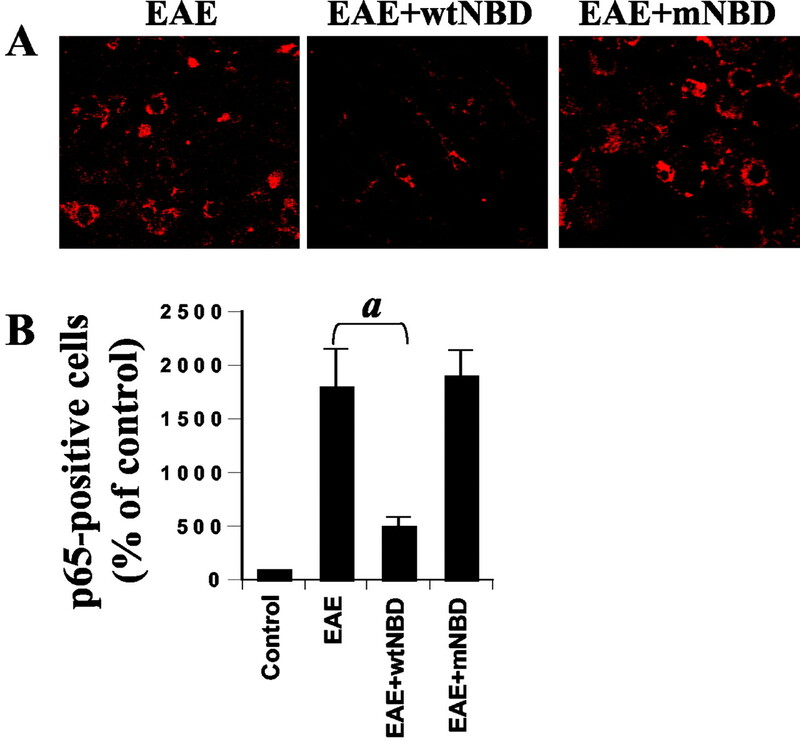 Second, clinical treatment of EAE animals with wtNBD peptides was capable of inhibiting the invasion of mononuclear cells into the spinal cord as well as the expression of NF-κB p65 within the spinal cord. Third, wtNBD but not mNBD peptides were able to inhibit proliferation of MBP-primed T cells in response to MBP. In addition, we observed that wtNBD but not mNBD peptides inhibited the ability of myelin-specific T cells to differentiate into Th1 effector cells both ex vivo and in vivo. In contrast, wtNBD but not mNBD peptides stimulated the differentiation of myelin-specific T cells into Th2 phenotype. Consistently, wtNBD peptides but not mNBD peptides also inhibited the encephalitogenicity of myelin-specific T cells. Fourth, clinical treatment of wtNBD but not mNBD peptides was also able to ameliorate (L+I)-induced inflammatory events in vivo in the cerebellum, suggesting that wtNBD peptides are capable of exerting an anti-inflammatory effect in the CNS. Recently, Weil et al. (17) have shown that, during TCR signaling, NEMO is recruited to the TCR. Thereafter, NEMO transmits the signal to IKKβ/IKKα through NBD peptide-sensitive pathway (11). Therefore, during Ag priming, wtNBD peptides should specifically knock down TCR-mediated induction of NF-κB activation, leaving out IKK-independent and other physiological pathways for NF-κB activation in T cells. Such specific targeting of the induction of NF-κB activation by NBD peptides in our experiments led to differential regulation of Th1 and Th2 bias of MBP-specific T cells. wtNBD peptides inhibited the ability of MBP-specific T cells to differentiate into Th1 type while stimulating their ability to differentiate into Th2 type. Therefore, our results suggest that differentiation of myelin-specific T cells into Th1 type is positively regulated by induced NF-κB and differentiation into Th2 type is negatively regulated by induced NF-κB. In contrast, Hilliard et al. (7) have shown that myelin-specific T cells in NF-κB1 (p50)-deficient mice are deficient in differentiating into either Th1 type or Th2 type. Considering the fact that, in p50−/− mice, there is complete absence of biological activity of the so-called p65/p50 heterodimer (induced plus basal), one can speculate the requirement of basal NF-κB activity for differentiation of myelin-specific T cells into Th2 ones. However, additional studies are required to prove or disprove these hypotheses. Infiltration of leukocytes into the CNS is a key neuroinflammatory event in EAE as well as MS. Although the exact mechanism of leukocyte invasion is not completely understood, this process most likely involves the expression of endothelial VCAM-1 and ICAM-1 (18), which is temporally correlated with the onset of clinical signs. NO, a major mediator in immune and autoimmune functions, has been also shown to increase permeability of the BBB, allowing substances to enter into the brain passively leading to vasogenic edema and secondary brain damage (19). Although the precise molecular mechanisms for NO-induced breakdown of the BBBare not completely understood, in a cell culture model of the BBB, NO leads to a rapid breakdown in model barrier integrity, resulting in a reduction in endothelial cell ATP content and GAPDH activity (20). It is important to note that expression of these inflammatory adhesion molecules like ICAM-1 and VCAM-1 as well as iNOS depends on the activation of NF-κB (6, 15, 21). Therefore, these inflammatory molecules being induced by activated NF-κB may guide inflammatory leukocytes into and through the CNS, thus contributing to their multiplication and finally to BBB disruption and broad-spectrum inflammation. Therefore, the protective effect of NBD peptides against the leukocyte invasion into the CNS could be mediated through the inhibition of induced NF-κB activation and thereby the inhibition of adhesion molecules. Neuroantigen priming of T cells may occur outside the CNS (spleen and lymph nodes) or at the periphery of the BBB (22, 23). Neuroantigen-primed T cells are mainly enriched Th1 cells, and after priming, they extravasate into the CNS and become further activated or polarized toward Th1 (22, 23). Therefore, it is possible that, without penetrating into the CNS, NBD peptides may inhibit the activation or differentiation of neuroantigen-primed T cells into Th1 even outside the CNS and thereby may ameliorate the disease process. Alternatively, the other possibility is that, without inhibiting peripheral immune cells such as T cells, this drug can enter into the CNS and inhibit the inflammatory reaction induced by differentiated Th1 effector cells. Interestingly, wtNBD peptides appear to work through both mechanisms. First, wtNBD peptides inhibited the ability of myelin-specific T cells to differentiate into effector Th1 cells both ex vivo and in vivo. 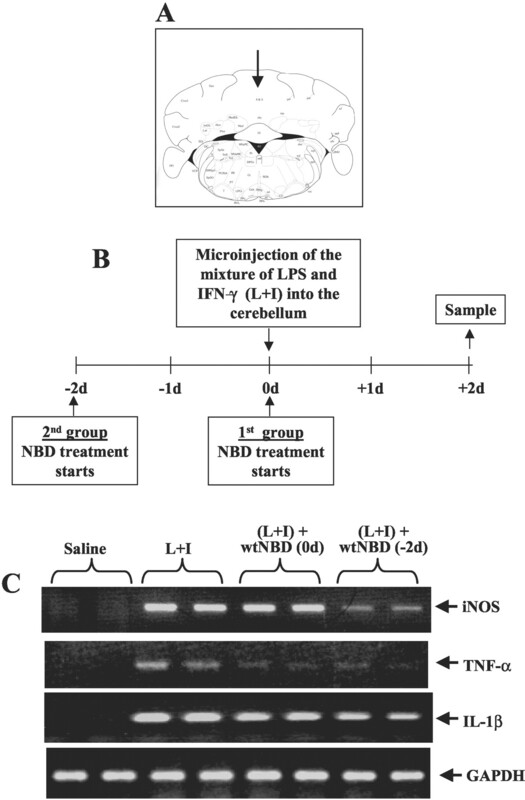 Second, therapeutic administration of wtNBD peptides reduced (L+I)-induced inflammatory events (expression of iNOS, IL-1β, and TNF-α) in vivo in the brain. Although this study does not provide direct evidence about the entry of NBD peptides through BBB, because the integrity of BBB is compromised due to intracerebellar injection, our results do suggest that wtNBD peptides are able to inhibit CNS inflammation in vivo induced by IFN-γ, a cytokine that is released by effector Th1 cells. These results also suggest that, apart from MS, NBD peptides may have therapeutic importance in the treatment of other neurodegenerative disorders like Alzheimer’s disease and Parkinson’s disease where inflammation within the CNS plays an important role in disease pathogenesis (24). ↵1 This study was supported by grants from National Institutes of Health (NS39940), National Multiple Sclerosis Society (RG3422A1/1), and Michael J. Fox Foundation for Parkinson’s Research. ↵3 Abbreviations used in this paper: MS, multiple sclerosis; EAE, experimental allergic encephalomyelitis; BBB, blood-brain barrier; iNOS, inducible NO synthase; IKK, IκB kinase; NEMO, NF-κB essential modifier; NBD, NEMO-binding domain; wt, wild type; m, mutated; GFAP, glial fibrillary acidic protein; MBP, myelin basic protein; dpt, day posttransfer; LNC, lymph node cell; L+I, LPS plus IFN-γ. Martin, R., H. F. McFarland, D. E. McFarlin. 1992. Immunological aspects of demyelinating diseases. Annu. Rev. Immunol. 10:153. Tuohy, V. K., R. A. Sobel, M. B. Less. 1988. Myelin proteolipid protein-induced experimental allergic encephalomyelitis. J. Immunol. 140:1868. Benveniste, E. N.. 1997. Role of macrophages/microglia in multiple sclerosis and experimental allergic encephalomyelitis. J. Mol. Med. 75:165. Du, C., M. W. Khalil, S. Sriram. 2001. Administration of dehydroepiandrosterone suppresses experimental allergic encephalomyelitis in SJL/J mice. J. Immunol. 167:7094. Parkinson, J. F., B. Mitrovic, J. E. Merrill. 1997. The role of nitric oxide in multiple sclerosis. J. Mol. Med. 75:174. Ghosh, S.. 1999. Regulation of inducible gene expression by the transcription factor NF-κB. Immunol. Res. 19:183. Hilliard, B., E. B. Samoilova, T. S. Liu, A. Rostami, Y. Chen. 1999. Experimental autoimmune encephalomyelitis in NF-κB-deficient mice: roles of NF-κB in the activation and differentiation of autoreactive T cells. J. Immunol. 163:2937. Pahan, K., M. Schmid. 2000. Activation of NF-κB in the spinal cord of experimental allergic encephalomyelitis. Neurosci. Lett. 287:17. Wooten, M. W.. 1999. Function for NF-κB in neuronal survival: regulation by atypical protein kinase C. J. Neurosci. Res. 58:607. Mattson, M. P., C. Culmsee, Z. Yu, S. Camandola. 2000. Roles of NF-κB in neuronal survival and plasticity. J. Neurochem. 74:443. May, M. J., F. D’Acquisto, L. A. Madge, J. Glockner, J. S. Pober, S. Ghosh. 2000. Selective inhibition of NF-κB activation by a peptide that blocks the interaction of NEMO with the IκB kinase complex. Science 289:1550. Dasgupta, S., Y. Zhou, M. Jana, N. L. Banik, K. Pahan. 2003. Sodium phenylacetate inhibits the adoptive transfer of experimental allergic encephalomyelitis in SJL/J mice at multiple steps. J. Immunol. 170:3874. Dasgupta, S., M. Jana, X. Liu, K. Pahan. 2002. Myelin basic protein (MBP)primed T cells induce nitric oxide synthase in microglial cells: implications to multiple sclerosis. J. Biol. Chem. 277:39327. Paxinos, G., K. B. J. Franklin. 2001. The Mouse Brain in Stereotaxic Coordinates Academic, New York. Pahan, K., F. G. Sheikh, A. M. S. Namboodiri, I. Singh. 1998. N-Acetyl cysteine inhibits induction of NO production by endotoxin or cytokine stimulated rat peritoneal macrophages, C6 glial cells, and astrocytes. Free Radical Biol. Med. 24:39. Weil, R., K. Schwamborn, A. Alcover, C. Bessia, V. Di Bartolo, A. Israel. 2003. Induction of the NF-κB cascade by recruitment of the scaffold molecule NEMO to the T cell receptor. Immunity 18:13. Weller, R. O., B. Engelhardt, M. J. Phillips. 1996. Lymphocyte targeting of the CNS: a review of afferent and efferent CNS-immune pathways. Brain Pathol. 6:275. Thiel, V. E., K. L. Audus. 2001. Nitric oxide and blood-brain barrier integrity. Antioxid. Redox Signal. 3:273. Hurst, R. D., S. Azam, A. Hurst, J. B. Clark. 2001. Nitric-oxide-induced inhibition of glyceraldehyde-3-phosphate dehydrogenase may mediate reduced endothelial cell monolayer integrity in an in vitro model blood-brain barrier. Brain Res. 894:181. Pahan, K., F. G. Sheikh, X. Liu, S. Hilger, M. McKinney, T. M. Petro. 2001. 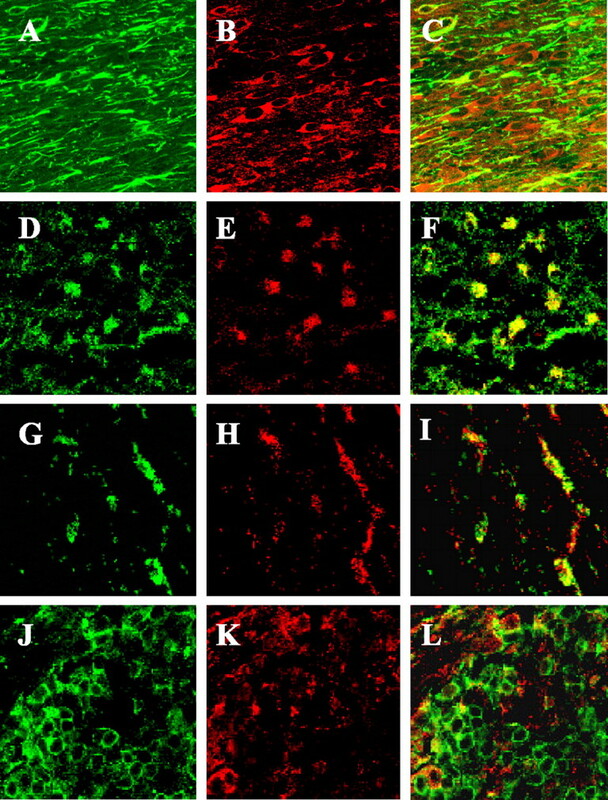 Interleukin-12 p40 induces nitric oxide synthase and activates NF-κB in microglial cells. J. Biol. Chem. 276:7899. Jana, M., X. Liu, S. Koka, S. Ghosh, T. M. Petro, K. Pahan. 2001. Ligation of CD40 stimulates the induction of nitric oxide synthase in microglial cells. J. Biol. Chem. 276:44527. Liu, H., A. J. MacKenzie-Graham, K. Palaszynski, S. Liva, R. R. Voskuhl. 2001. Classic myelin basic proteins are expressed in lymphoid tissue macrophages. J. Neuroimmunol. 116:83. Martino, G., H. P. Hartung. 1992. Immunopathogenesis of multiple sclerosis: the role of T cells. Curr. Opin. Neurol. 12:309. Liu, B., J. S. Hong. 2003. Role of microglia in inflammation-mediated neurodegenerative diseases: mechanisms and strategies for therapeutic intervention. J. Pharmacol. Exp. Ther. 304:1.